Indisputable is the fact that LAPD is known throughout the free world. The acronym is arguably the widest known in all of law enforcement. And there are some iconic associations that go along with that fame. The badge. City Hall gleams at those who choose to cast a glance. The motto. “To protect and to serve,” is also known the world over. So, too is SWAT. Each of these important elements of the larger LAPD brand will live on. But another LAPD icon is headed towards a welldeserved retirement. Parker Center. Most of the Department has vacated headquarters and headed off to its new home on West 1st Street. What was once the Police Administration Building is giving way to a nearby structure, which, coincidentally, is also known as the Police Administration Building. With the dedication of the new home of the LAPD, and the staged retirement of Parker Center, there have been many, many inquiries about the history of LAPD’s primary abode. The many active and retired, sworn and civilian that worked there are familiar with the background of 150 North LA, however, there is a much larger crowd that is less informed, but surprisingly interested. One of the greatest curiosities involves the building’s name. Because it is so widely known as Parker Center, scores of people are unaware that the building did not begin officially honoring the memory of Chief William H. Parker until March 25, 1969. Parker Center, or PAB, was born in concept long before this. Portions of the Department moved from their digs at 314 W. 1st street in 1930. Occupying various areas of the new City Hall, this was the first indication that LAPD’s 1st street offices, which were opened in 1896, were insufficient. By 1947 a police construction bond had passed, making way for the planning of PAB. A series of delays, resulting from rising costs and recommended changes to the building, meant that ground wasn’t broken until the end of 1952. 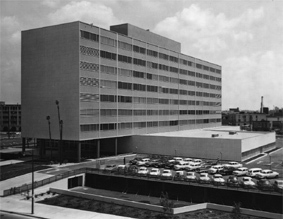 Completion of the 407,826 square foot building wrapped up in 1955. Forasmuch as the current occupants of Parker Center were there in the beginning, others were destined to move, or disappear entirely. Traffic is now in the four winds of the operations bureaus. Administrative Vice has morphed more than once. Central got a new home a couple of decades ago. Communications moved more recently. The fifth floor library and the eighth floor cafeteria came and went. R & I, Property, Jail Division and third floor detectives largely endured the various iterations of the building. LAPM files tell some other stories about the life and times of LAPD’s base of operations. The cantilevered tile mosaic in the lobby was the largest in the world when it was created. More than ¼ million tiles comprise that piece of artwork. The sculpture south of the first floor entrance was not universally accepted. In fact, one city councilman vociferously objected, resulting in a 1955 purchase offer for the tidy of sum of $10,000. Coffee rooms, apparently weren’t the highest of priorities, either. Documents pre-dating the building’s opening outline the “150 Club’s” proposal for establishment and maintenance of first floor break areas. LAPD’s elegant edifice saw so many serve for so many years, and for so many different purposes. This was a place replete with clerks and chemists, jailers and junkies and of course cops and criminals. For a structure of nine stories, the stories amassed by PAB’s masses are darn near innumerable. The tales woven in “The Building” will live on long after the last light is doused. Once that switch is thrown, LAPM hopes the pictures and notes on the following pages will serve as a tribute not just to a great building, but to all who contributed to the indisputable history of the most famous police building in the country, Parker Center. It seemed like an early holiday season this year. What with the Department getting a new home, and then a new boss (Congratulations to Chief Charlie Beck), it sure seemed like the seasonal benevolence experienced an early arrival. Both of these significant events kept the Historical Society busy recently, but we weren’t left out of the spirit of the giving. Our gifts came on a larger scale, not from local officials, or from local government, but from the national level. For the first time in the history of LAPM, and apparently the history of police historical societies, we have been awarded a federal grant. The National Endowment for the Humanities is funding archival storage here at the society. Their generosity will allow the Historical Society to better care for its oversized photographic holdings. Besides the obvious financial benefits, the grant also confirms that this important federal institution believes in LAPM and its preservation capabilities. Besides extending our thanks to NEH, we thank our very talented partners at the Getty Center, Tracey Schuster, Beth Guynn and Anne Blecksmith for all they have done with this process and the photo archive. The American Association of Museums has also committed to assisting the Historical Society with another project. A group of museum professionals, from throughout the country, will be volunteering some of their time here next May. On a single day, the group will tackle a preservation project related to our holdings of Beat magazines. With their numbers and abilities, work that has been delayed due to limited resources, will be completed in a single day. This grant of time and talent is another signal that the Historical Society is being noticed well beyond the borders of Highland Park, and the City of Angels. Both of these projects are important accomplishments for the Historical Society and each will contribute to the ongoing efforts to preserve the storied past of the LAPD. It is certainly flattering to receive the talented assistance that will be coming our way, but we also recognize this as a season where it is better to give than to receive. So, we have been giving (supporting) in a whole bunch of different ways. LAPM sponsored the challenge coins which Chief Bratton distributed during a final official visit to Parker Center. 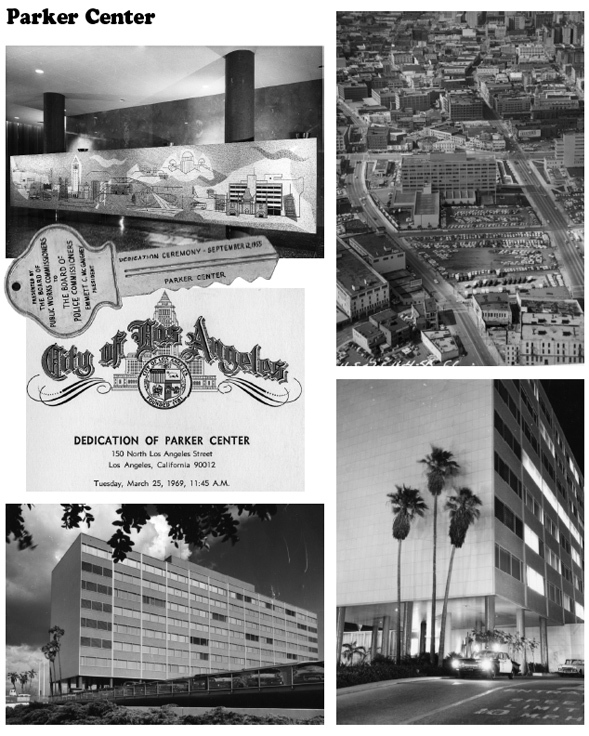 The Historical Society also provided photos to the LA Times for its on-line slide presentation covering the history of Parker Center. Uniforms and volunteers from LAPM were supplied for use during the opening of the new Police Administration Building. Vintage vehicles from the LAPM fleet were also deployed to a considerable number of events during the recent days. LAPM also distributed candy to the local trick-ortreaters, and supported the events related to the appointment of LAPD’s 56th Chief of Police. These contributions are important to all of us here, as are some of the bigger projects that are currently underway. Two of the most notable are a formal partnership with LAUSD’s Police Academy Magnet School program and a partnership with the California Homicide Investigators Association (CHIA). Recently LAPM proposed a partnership with the Department and the Academy Magnet schools that would bring the students to the LAPM museum on a regular basis. The proposal was accepted and the final details are nearly complete. The CHIA project also holds great promise for that organization, the Department and LAPM. In early March, CHIA will hold its annual training conference at the Palms Resort and Casino in Las Vegas. LAPM will take a travelling exhibit, focused on the history of notable homicides in Los Angeles, to the conference. Many photos, video and artifacts spanning the famous and infamous murder cases of the last 100+ years will be on display both to CHIA members and later to the general public. This partnership is an opportunity for LAPM to contact a much wider audience than our Highland Park home allows. This collaboration with RHD personnel is well under way, and holds great promise for all of the enterprises involved in this unique project. 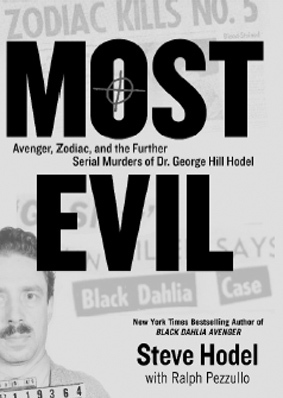 Recently, Most Evil, introduced evidence linking Dr. George Hodel to other notorious murders. Steve has uncovered connections to a famous killing in Chicago, as well as a connection to the Zodiac killings here in California. Steve will be signing his new book at the Historical Society at 7 p.m. on the January 15th. Prior to the event, Steve will be hosting a VIP reception at the Historical Society where he will be discussing both books with ticketed visitors. Tickets are available by contacting LAPM, and information about the general book signing is available on our website at www.LAPM.com. The LAPM holiday season also included two important events. Participation in the Highland Park Holiday Parade allowed us to roll out the freshly spruced up 1958 Chevy patrol car. Its vintage appearance, and in particular, the vintage sound of its siren were a great hit with parade watchers. The following day, LAPM honored its dedicated cadre of volunteers. The annual holiday luncheon was held at Palermo’s where we said thanks to those who have lent scores of time to LAPM this year. Besides the generous gastronomical gesture, we formally thank Alan Berta, Keith Ricks, Joel Montes de Oca, Anne Blecksmith, Beth Guynn, Tracey Schuster, Angie Roman, Gustie Bell, Cal Drake, Margie Regan, Gerry Turner, Joan Renner, Nicholas Lucero and Skip Levi. The contributions of these thoughtful folks truly advanced the museum during the year that is now rapidly closing. Unfortunately, another close friend and supporter of LAPM was lost recently. 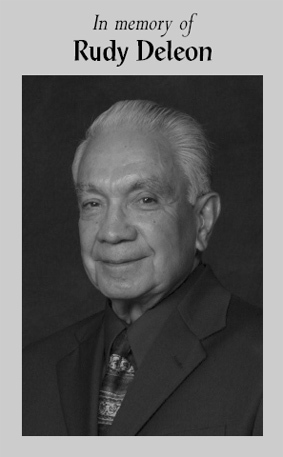 Rudy Deleon was another of the thoughtful ones who truly advanced the museum. His commitment dates to the earliest days of the Historical Society, and his service to the Department and the community dates to many decades before the Society’s existence. Rudy was a true champion of all he pursued and his loss was felt in many places by many, many people. We share his LAPM portrait so that his memory will live with our Boards, staff, volunteers, members and all that knew and cared about this great man. Our Highland Park home, is not being ignored these days either. In fact, another unique project is coming in early 2010, courtesy of a thoughtful retiree. Steve Hodel, a retired homicide detective and current bestselling author, will visit Old Number 11 on the evening of January 15, 2010. While this isn’t the original date that will live in infamy, it is nonetheless an infamous date. Elizabeth Short was murdered on that date in 1947. What has since been termed the Black Dahlia murder remains in the public conscience, and is an oft inquired about subject at LAPM. Steve’s first book, The Black Dahlia Avenger, became a bestselling title. His conclusion, that Elizabeth Short, was murdered by his own father was supported by a significant amount of compelling evidence, and although the murder is technically unsolved it is hard to argue with Steve’s solution. Many of the details of this killing are intertwined in Steve’s second book.